This is a huge weekend, an historical weekend, if you're a fan of Guns N' Roses. The new album, Chinese Democracy, is being released. It's an album some 16 years in the making. Lead singer Axl Rose, the only original member remaining from the band's late 80's glory days, has been writing, rewriting, recording, tweaking, and fussing with this record since before the first Clinton administration. In other words, he's been editing. As any writer knows, it's the editing process that can really slow things down. See, back in those glory days, Guns N' Roses were raw energy. Young, fresh. Don't think about it, just rock it. That was the era of classics like Welcome to the Jungle and Paradise City. I wonder what would have happened if Axl Rose had hired an editor back then. What would that editor say about perhaps the band's most popular hit of all time, "Sweet Child O' Mine"? Just got your manuscript and demo for the song "Sweet Child O' (sic) Mine." I think we need to talk. As your editor, I am responsible for making your songs as cogent as possible, for helping them reach the high editorial standards your public has come to expect. With this one, I am certainly earning my keep. After several attempts to reach you by phone, I am sending along my notes. Please make appropriate fixes as soon as possible, at which point I can send them to copy editing and proofreading in time for your upcoming studio session. "She's got a smile that, it seems to me" -- Why equivocate? You weaken your point by framing this as a mere personal observation instead of a fact. "Reminds me of childhood memories" -- Redundant. You either have a memory or you're reminded of something. You're not reminded of a memory. Heavy-metal fans won't stand for such writing, my friend. "Where everything was as fresh as a bright blue sky" -- I asked around the office and no one is sure a blue sky is "fresh." You could have a blue sky at the end of a long, sweaty day and there would be nothing fresh about it. And she reminds you of a time when things were fresh? Fond reminiscences of freshness are no foundation for love. Fix. "Now and then when I see her face it takes me away to that special place" -- Again, you're weakening your own argument. Why does the sight of her face transport you only periodically? And is it just her smile or her entire face that does this to you? Because you've already said both. Consistency, Axl! "And if I stared too long, I'd probably break down and cry" -- Why would you do that? Because you miss the freshness you described earlier? I think the whole "fresh" thing is really tripping you up. Also, crying? Wimpy. "She's got eyes of the bluest skies" -- See, this is just getting worse. Now her eyes are made of sky? Nice imagery, but you just got done saying her smile reminded you of memories of sky. Is this verse actually supposed to be a second draft of the first verse? Am I just confused on formatting? Help! 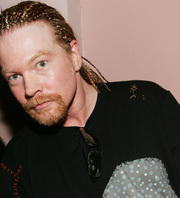 "As if they thought of rain" -- Axl, eyes can't think of rain. And even if they could, which they can't, why would bluest skies think of rain? Perhaps less imagery of thinking eyes made of sky and more direct exploration of your feelings? "I hate to look into those eyes and see an ounce of pain" -- Well, hell. I guess in your special Axl World anything is possible. Eyes can be made of sky, ponder the weather, and exhibit pain in amounts that can be weighed. "Her hair reminds me of a warm safe place where as a child I'd hide" -- Delete. Fix. Do something. You'd hide in a place that reminded you of hair? Never show me such phrases again. "And pray for the thunder and the rain to quietly pass me by" -- Whew. OK, listen to me now: Thunder can't quietly do anything. It's thunder. And, more importantly, do you really want to come across as a wuss who's constantly on the verge of weeping and skittering into hair caves to escape from rain? Is this a song about love or climatic anxiety? You need to work these things out. Finally, Axl, I think we might have had a misunderstanding regarding my previous notes. When I wrote in colored pencil "Where do we go now?" I wasn't offering that as a lyric. I was simply observing that, in narrative terms, the song needed to progress in some way. You love the girl, she's helping you work through some issues, whatever. So where do we go now? But instead of providing a satisfactory conclusion, you simply took my note and repeated it over and over again before ultimately just stating the title of the song. This is unacceptable. Don't ask us, the listeners, where we go. That's up to you as the writer! Tell us where we go now! Again, let's try to fix these things soon and get "Sweet Child of Mine" ("My Sweet Child"?) into your fans' hands as quickly as possible. Because, frankly, if it should ever hit the street in its current form, the song would be a colossal failure. Justin - You can get the episode on iTunes. Go to the iTunes store and do a search on Weekend America. Then click on the podcast and find the Hour2 podcast from 11/22. I was laughing out loud (and I don't normally do this) when I heard this on the radio - and I had to find this to share with my wife. I heard this story on the radio and it's hilarious! Is it available as an MP3?